NATURAL HABITAT AND PREFERRED SITE: East Texas sandy acid soils and other similar areas of the country. 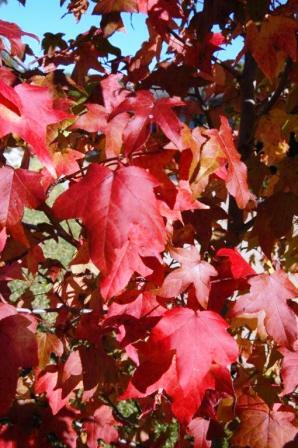 Sweetgum will adapt to sand or clay soils as long as they are deep and not associated with shallow white limestone rock. 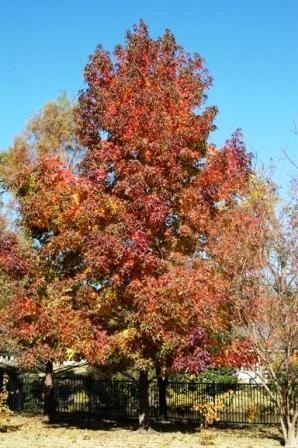 Sweetgum normally grows in low bottom lands and moist soil areas. One of the most common hardwood trees in the east Texas Pineywoods. 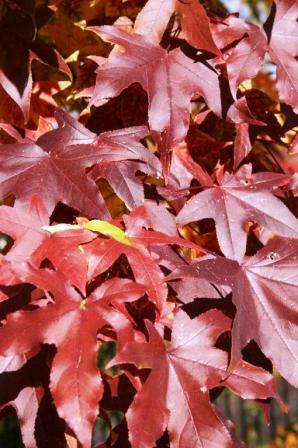 IDENTIFICATION INFORMATION: Sweetgum is distinctive in shape and texture and can be easily identified. It is upright, pyramidal with almost always a central, long, straight trunk, large star-shaped leaves, beautiful fall color and distinctive spiny fruit in the fall lasting through the winter. FLOWERS AND FRUIT: Greenish and unimpressive flowers form early in the spring as leaves emerge. Sexes are separate but on the same tree (monoecious). Fruit forms September to November as round, spiky fruit, 1 to 1 ½ inches in diameter on long stems. Only mature 1 or 2 of the flat wing seeds, the rest abort. Seeds are winged and small. BARK: Bark is smooth on young stems and trunks but becomes rough and deeply furrowed with age turning brown to gray. Stems often have corky wings and trunks also have corky spots. FOLIAGE: Leaves are simple, alternate, deciduous, star-shaped, 5 to 7 lobes, fall color is spectacular ranging from golden- yellow through reds into deep crimson, maroons and even purples. Leaves are fragrant when crushed. 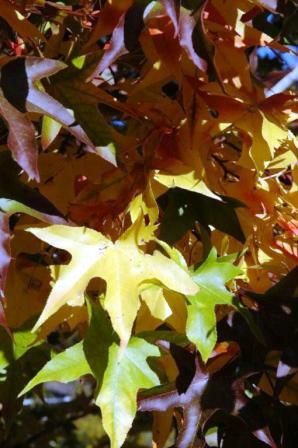 CULTURE: Sweetgum is easy to grow as long as the soil is deep. Grows at a medium growth rate. It can’t stand being above or into white limestone rock but can tolerate most other situations. Although it prefers deep, sandy, acid soils and plenty of moisture, it responds to good fertilization. It is easy to transplant in most any size. PROBLEMS: Chlorosis, a so called iron deficiency, shows up when planted in dry rocky soil, especially white rock. Easily damaged by fire. Some people consider the spiny balls a great nuisance. I kind of like them. Other pests include tent caterpillar, aphids and spider mites but those can be controlled easily with the Basic Organic Program. PROPAGATION: Done by planting the seed. Collect the fruit from the tree as they turn from green to brown but before they have completely dried. The spiky fruit can be spread out to dry until the seeds are released. The seed can be stored in a moist medium at 41 degrees for about 30 days. It normally takes 5 to 10 days at 68 degrees. Air dry the seed before storage in sealed bags or containers at about 35 degrees. Properly stored seed will remain viable for about 4 years. The seed can be planted outdoors immediately after they are collected or stratified for 1 or 2 months at 41 degrees. Leafy semi-hardwood cuttings can be rooted under mist in the summer. INSIGHT: Several bird species like to eat the fruit. Sweetgum is a source of a fragrant gum obtained from the inner bark and the wood. It is a source of one of the leading commercial hardwoods. Improved cultivars such as ‘Palo Alto’, ‘Burgundy’, ‘Festival’ and ‘Autumn Glow’ that were bred for better color and to be fruitless are not nearly as well adapted and not recommended. Rotunda loba is a grafted seedless cultivar that I also recommend.